Home apps BankeBehari BhajanApp Dwakadheesh Festival Govardhan Holi HoliBhajans indianrailways irctc irctcapp LordKrishna Mathura RadhaKrishna RailwaysApp TravellingApp Vrindavan Planning To Celebrate Holi In Mathura And Vrindavan – Download Railways App Today! Holi the Festival of Colours have been celebrated in India for thousands of years. Holi takes us closer to our religion and our mythology and that is the essence of celebrating this colourful festival. People from all corners of the world gather at Mathura and Vrindavan, to feel the essence of Holi in the land of Krishna. Lord Krishna had immensely strong bonding with the people of Mathura and Vrindavan and hence Holi is celebrated for more than a week. The celebration at the main Banke Behari Temple at Vrindavan is of great interest. Each major Krishna Temple in Mathura and Vrindavan celebrate Holi on a different day. The Gulal Kund in Brij a beautiful lake near Govardhan is also a popular place of Holi celebration. 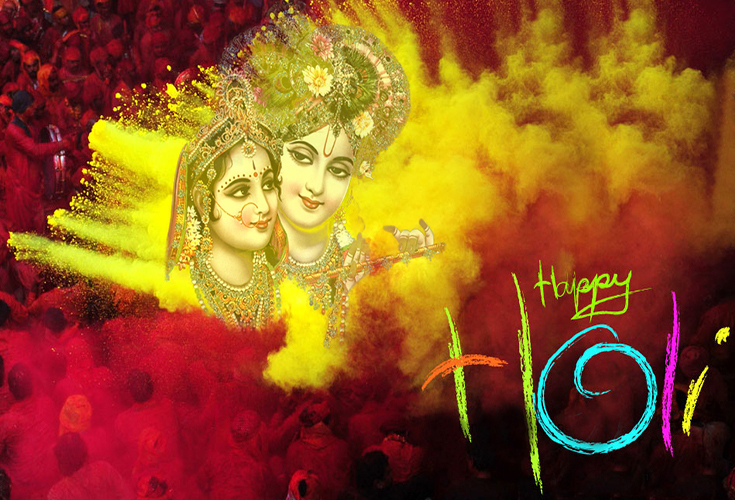 The tradition of playing colors on Holi is rooted to the legend of Krishna and Radha. Krishna applied every colour he wanted on Radha’s face and the tradition of applying colours to one’s beloved is religiously followed till date. Romance can be experienced in the atmosphere in Vrindavan especially during Holi. An excellent collection of popular Holi Bhajans on the Keyideas Bhajan App is enough to complete the festive feeling of Holi. Share these bhajans on the App with all Holi lovers and get drenched in the colours of Holi. Soak yourself in this wonderful collection of Holi Bhajans with your friends and families to add to the celebrations. These are several events at Vrindavan which attract thousands of tourists, who come and enjoy these week long events. Lathmar Holi at Vrindavan is quite popular where women beat men with lathis or sticks. Another event Phoolon Wali Holi is celebrated on the Ekadashi just before Holi at the Banke Bihari temple in Vrindavan. Here Holi is not celebrated with traditional colours but is played with flowers. Holi at Banke Bihari temple, the birth place of Lord Krishna, is celebrated a day before the actual day. On the actual Holi day, the festival is celebrated at the historical Dwakadheesh Temple in Mathura. The colourful Holi procession at Mathura starts at 2pm on the day of Holi and travels from Vishram Ghatto Holi Ghat. It is recommended that if you are travelling to Vrindavan during Holi then come early and stay back a little longer to capture some big events before and after the main Holi day. Plan your tip and book your confirmed tickets today through Keyideas IRCTC Railways App in seconds. The App has made the ticket booking process very simple and hassle free!